The leaders shortly after the gun. I admit it. Of all the great ‘cross racing that takes place each week in the Mid-Atlantic, I’m a bit biased toward the masters 3/4 field. This is my race and the one that is featured in most of the videos on this site. The podium at this year’s Tacchino Ciclocross was made up of five super-strong riders. These guys went hard all day and had a great battle at the end. At least that is what I learned by doing these interviews. The last time I saw them, as illustrated in the above image, was about 200 yards into the race. Having the top five weigh in gives us a great look at the decisive moments of the race. We not only get a peek at the winner’s strategy but how the other four reacted, and in hindsight, what they would have done differently. Under ideal conditions (you arrive on time, it’s not pouring down rain), how much time do you spend on the course before racing? Do you walk the course? Do any hot laps? What are you looking for during this time? Jay Morali (C3-Athletes Serving Athletes, 1st Place): I ride the course once when I arrive. I warm up on the road and then try and ride the opening sections of the course once more before the race. I am looking for the best lines since the start is so important and chaotic. Neal Sapp (Ben’s Performance Bikes, 2nd Place): I ride 2 laps. The 1st lap is slow just looking the course over and trying too find good passing zones and too figure out where I will be fast and sections I will be slow and what tire pressure I will use for that course. The 2nd lap is with some speed too see how it will all come together and flow. Jeff Anderson (HPC/List, 3rd Place): I get out on the course right away and do 2-3 laps but at Tacchino I ended up doing 4. First lap is slow to ‘see’ the course and then the other laps I will go at a quick pace but not hot. I sometimes even go back and redo a section if I didn’t like the feel of it the first time through. I pay attention to not only what looks like the primary line but any secondary lines that I might be forced to take to pass or due to traffic. I also watch others ahead of me. Sometimes I ride with another rider I know too. I am glad I did a 4th lap at Tacchino as they moved the course, so I knew what the change was. After that off to registration and the trainer. Scott Thompson (Squadra Coppi, 4th Place): With our race starting at 10am, I like getting to the venue at 8am and riding the course for a solid 30-45 minutes before the Cat 4 men start at 9am. I find this is a much more mentally pleasant way to warm up than spending the time on the trainer in the parking lot. It lets me get very comfortable with the course and warm up physically at the same time. I have been doing progressively faster laps to warm up, and I’ll usually test the key turns at speed. I’m looking for less bumpy lines, the fastest lines through turns, and also for places where back-ups may occur. Winfield lining up the sausage preme. We caught up with Dee Dee to talk about her day. How much time do you spend on the course before racing? For a 2:30 race, I usually arrive between 11 and 11:30. It takes time to get numbers, trainers set up, chat with a few people, try to make sure I am not too rushed. Do you walk the course? If it is super muddy, I may just walk the course and not ride but usually I will ride around while others are racing, check out potentially difficult areas, see how others ride those sections. I will hop on the course in between races for a few laps. One or two before the 1:30 race. What are you looking for during this time? DCCX took place October 18 at the Armed Forces Retirement Home in Washington D.C. It may have taken a bit longer than planned to get these interviews posted, but they are by no means out of date. Lots of great stuff here by some of the fastest men and women in the Mid-Atlantic. How long have you been racing ‘cross? Did you come from a road or MTB background? 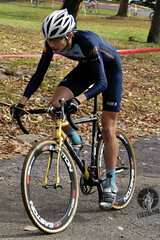 Joe Dombrowski (Haymarket Bicycles/Home Visit, 2nd Place Men’s Elite):This is my second season racing cyclocross. I come from a mountain bike background, but will probably split most of my time between road and ‘cross in the future. Dave Fuentes (Battley Harley Davidson/Sonoma, 1st Place Masters Elite): I have about 17yrs of road racing under my belt. I started racing cross last year. I got my first taste at Kelly Acres in the Cat 4 race. They upgraded me to Category 1, which matched my road category, immediately after that race. This has been my first full season of cross. Jay Morali (C3-Athletes Serving Athletes, 1st Place Men’s Masters 3/4): This is my 2nd season. I have a minimal road background. 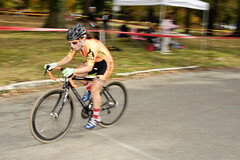 Lenore Pipes (Unattached, 3rd Place Elite Women):I started racing road and cross last year. Road is my main focus but I love cyclocross. Keith Rohr (Adventures for the Cure, 3rd Place Masters Men 3/4): This is my third year of ‘cross and what will be my first full season of racing. The past two years I only jumped in 5 or 6 ‘cross races. I’ve dabbled in some road racing, but really enjoy mountain biking and totally love the camaraderie of ‘cross racing. Becky Frederick (Kelly Benefits Strategies/LSV, 2nd Place Women Cat 4): I picked up cross last year once I figured out what it is. A buddy mentioned at a mountain bike race (I was new to that last year, too) that I’d like it. He wasn’t wrong. Now that we are in the thick of the ‘cross season, what does a normal training week look like for you? Do you do any off-the-bike training during cross season? Mike Birner (Ben’s Performance Bikes/BMC, 3rd Place Elite Masters): In the week leading up I only did a light ride on Wednesday, some hills and short motorpacing session behind public transit on Thursday and a short ride with some openers on Saturday. All of about 4 hours not including race day. Joe Dombrowski: Less volume and more intensity than the mountain bike season; this is more true as the season progresses. Typically, I reserve Mondays and Fridays as easier spins, with intervals on Tuesday and Wednesday. Thursday is my longer, endurance pace ride for the week. I also incorporate core work, plyometrics, and cx skill sessions during the season. Lenore Pipes: On Tuesdays, I run up the Philly Art Museum steps like in that film Rocky … except shouldering a bike. On Thursday nights, I race at Fifth Street Cross (formerly the coolest cyclocross ever®) where I’ve won Schick Smooth Move Rider of the Night for gracefully crashing into the barriers and I was Lantern Rouge for the entire series last year which might be partly due to the fact that I still have yet to take a PBR Shortcut. Jay Morali: I try and get two good weekday workouts in. I try and focus on rest and recovery. Dave Fuentes: I am fortunate to have enough time mon-fri to do 5-6 hrs if I want. I usually peak out at about 25-30 hrs a week for road racing, but after a long road season, I can get by with about 12 hrs a week for cross races. Since the races are shorter, my training is much shorter, but very specific, depending on what I want to do for the day. Arley Kemmerer (Hub Racing) is an elite level women’s cyclocrosser that has been racking up UCI points this season with a slew of top 20 finishes at big races. 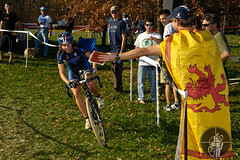 In her third season of ‘cross, Arley has established herself as a top racer in the Mid-Atlantic region. Happy, but not satisfied, with how her season has progressed so far, Kemmerer would like to improve on her already impressive top 25 national ranking and finish out the MAC series in the top three. When it comes to the MABRA Cyclocross Series, nobody has come close to Kemmerer. She powered away from the competition in the muddy Ed Sander Memorial race back in September and did the same at this past Sunday’s DCCX. We caught up with Arley—who somehow balances a full race schedule with the demands of being in her third year of law school—to learn more about her season, training and the DCCX race. You were a skier before bike racer. How does the skill-set from skiing transfer to cycling? Ski racing has definitely helped for cyclocross. A big part of ski racing is carrying your speed efficiently around turns, which requires you to choose and hold a fast line, which translates well into navigating a cyclocross course. How long have you been racing ‘cross? Is CX or road your main cycling focus? The Breast Cancer Awareness Cyclocross Challenge presented by Antietam Velo Club took place Saturday, October 3, 2009. The first race in a weekend doubleheader for the MABRA Cyclocross Series, the course featured several hairpin turns, good off-camber riding, a sand pit made unridable by strategically placed barriers, and a mean little hill. We caught up with the podium finishers in several categories to find out about their day.